Opening the window of opportunity. As part of a local outreach program at St Saviour’s Church in Redfern, the revitalised One4Food Soup Kitchen supports better living habits for people in need by establishing healthy, positive relationships in a loving environment. 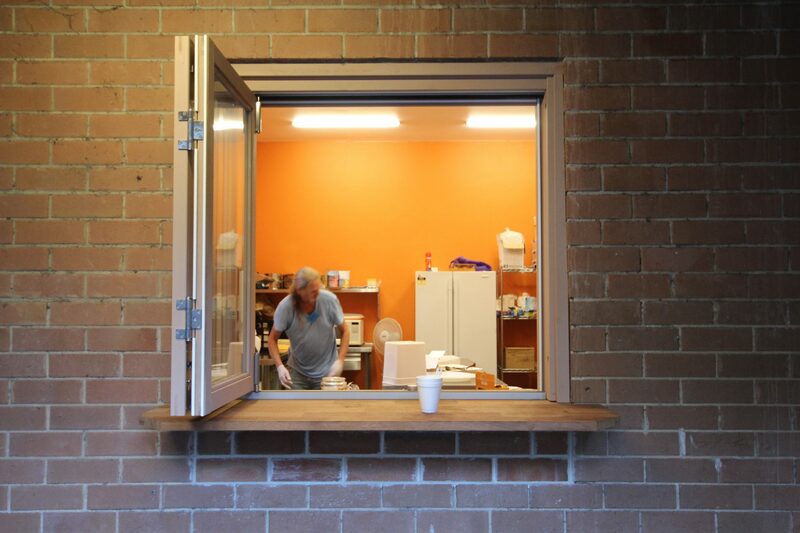 Originally working out of a small church kitchenette, the One4Food Soup Kitchen provides meals and food packages from OzHarvest to local people in need, while connecting them to other services and community. Our original concept for the upgrade featured a new commercial kitchen with integrated courtyard seating and a garden for growing produce to use. Bijl Architecture designed and detailed the kitchen as stage one of the project, with a cheerful orange and yellow colour scheme for kitchen and dining hall respectively, with two serveries opening out to the courtyard and hall, strongly connecting with the community. Our design for the second stage of the project – the outdoor courtyard and garden – won the Urban Commons Foodscape Competition 2014, along with a Foodscape outdoor furniture setting valued at $5,000. This part of the design provides additional courtyard seating, and a much needed community garden to support the mission in its work. The community garden helps build new relationships and positive living habits through gardening, growing food and human interaction.